Potatoes do not preserve well when left whole, but you can turn them into twice-baked potatoes and place them in the freezer for up to three months. This method of preserving works well for extra potatoes from a plentiful garden harvest or a dinner for which you baked too many potatoes. Freezing the potatoes individually allows you to reheat as many as you need for an easy-to-make side dish. 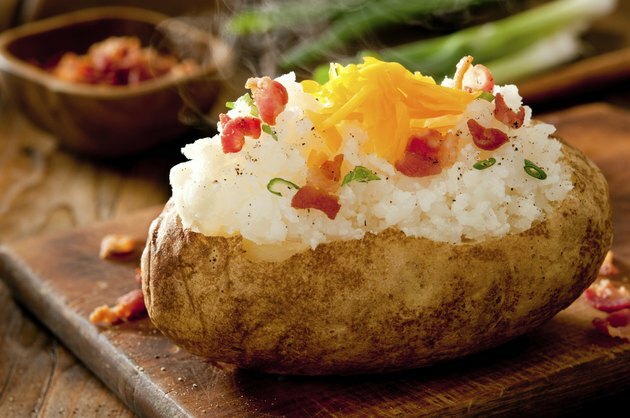 Regular baked potatoes become soft and mushy when frozen, but a twice-baked potato holds its shape and texture during reheating. Prepare the potatoes according to your favorite recipe. Sprinkle cheese on top of the cooked potatoes with cheese so they will be ready to bake again after you freeze them. Wrap each potato in aluminum foil. This makes it easy to remove one potato from the freezer and bake it. Place four to five wrapped potatoes in a freezer bag with a zipper seal. Squeeze as much air out of the bag as possible before sealing. Label the bag and add the date on which you are placing them in the freezer. Twice-baked potatoes will stay fresh for about three months in a freezer. Place the potatoes in a location in the freezer where they will not become crushed. Once frozen, you may place lightweight items on top without the fear of crushing them. Defrost the potatoes before cooking by placing them in a refrigerator one day earlier, or place them directly into an oven preheated to 350 degrees Fahrenheit. Frozen twice-baked potatoes take about 1 1/4 hours to bake, thawed potatoes take about 45 minutes to bake. There is no need to remove the foil until after the potatoes bake. Reheating with a microwave may cause a twice-baked potato to become mushy. University of Nebraska at Lancaster; Common Foods that May Not Freeze Well; Alice Henneman, et al.